Does Brown Rice Raise Triglycerides? Taking a therapeutic dose of fish oil under your doctor's supervision lowers your triglycerides in as little as month. This is because fish oil contains two heart-healthy polyunsaturated omega-3 fatty acids, EPA and DHA, which not only help lower triglycerides, but also reduce arterial plaque and improve the health of your arteries. Fish oil is used along with diet and lifestyle changes to bring triglycerides into a healthy range. Obtain the guidance of your health care provider before taking fish oil to treat high triglycerides. Triglycerides are the most common type of fat in your body, and many of the fats in your diet are in the form of triglycerides. In addition, your body converts excess calories, sugar and alcohol to triglycerides and stores them as fat. It's crucial to keep your triglycerides in a healthy range. A normal triglyceride level is under 150 milligrams per deciliter. Levels between 151 and 200 milligrams per deciliter are considered borderline high. Having levels above 200 milligrams per deciliter increases your risk for heart attack and stroke. The triglyceride-lowering properties of fish are well-documented. 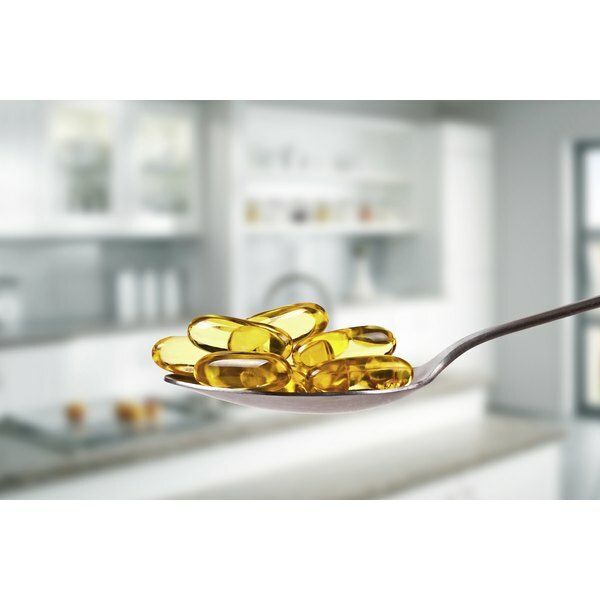 Based on previous clinical data, fish oil lowers triglycerides on average 25 to 50 percent after just one month of taking a therapeutic dose, according to a review published in the May 2012 edition of the journal Molecular and Cell Biology of Lipids. The authors assert that the primary way fish oil reduces triglycerides is by lowering the amount your liver produces. Increasing the amount of bad fats your body eliminates is a secondary way fish oil reduces triglycerides, according to the authors. It's particularly necessary to make dietary changes to manage your triglycerides levels long term. A diet rich in simple sugars is a major contributor to high triglycerides, and this includes sugary beverages. In fact, sugary beverages alone increase the risk of elevated triglycerides, according to a study of over 42,000 men published in the April 2012 edition of the journal Circulation. Swap out simple sugars like those in candy, cookies, potato chips, pizza, muffins and other pastries with healthier options like fresh fruit; low-sugar, reduced-fat yogurt; whole oats; whole-grain pasta; and brown rice. Being overweight is a risk factor for high triglycerides, so work with your doctor to get your weight into a healthy range. Reducing the number of calories you eat and eating smaller portions is a good place to start. Lack of exercise is another risk factor. Getting physical activity helps your body use triglycerides, so aim to get at least 30 minutes of exercise most days of the week. Start with walking if you're not used to exercise. Walking is a gentle way to get exercise and a good way to get outdoors. Biochemica et Biophysica Acta: Fish Oil -- How Does It Reduce Plasma Triglycerides? Does Folic Acid Help Reduce Cholesterol?